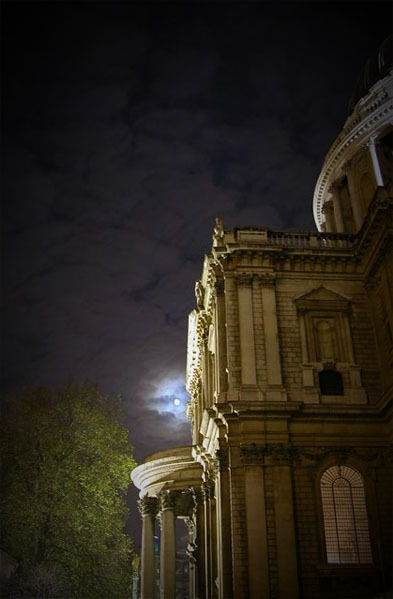 A quiet night at St Pauls Cathedral; ever-so-slightly warm weather, improved by the thin layer of cloud high overhead. Slowly the moon breaks through, it's gentle light casting extra shadows on the already illuminated building. But wait, that's no moon, it's the headlight of an intergallactic space ship commanded by an alien race intent on the destruction of the Earth! Nee-aaarrww-Boom! Space guns light up the sky! Bzzt! Pow! Bricks fly from the old building, people run in panic, screaming! Rat-a-tat-a-tat! Locals return fire, but more space guns blast, vapourising them where they stand. Rrr-fzzt-whoofmph! The heat ray cuts through the street, burning up cars and buildings like they are paper. Sss-sss-BOOM! A new bomb hits the street but it doesn't explode like the others. Out pours a tentacled, strangling lifeform, creeping, creeping; it envelopes and consumes everything it touches.